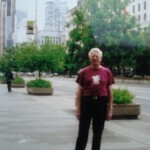 John, aka ‘Bampa’ has just submitted this photo for the DragonDrop Adventure T-Shirt Gallery. Two first; 1./ the first DD shirt shot from Canada, 2./ The first time a DD shirt has ever been worn tucked in. You can see the CN Tower in the background. He apologised for it being out of focus – poorly camera.